G. Cogeval, I. Cahn (eds. ), Pierre Bonnard: Peindre l’Arcadie, exh. cat., Paris, 2015. J.-L. Prat, ‘Pierre Bonnard or An Enduring Painter’ in exh. cat., Bonnard, Martigny, 1999. A. Terrasse, Bonnard: The Colour of Daily Life, trans. L. Hirsch, London, 2000. This work is accompanied by a certificate of authenticity signed by Pierre Vernon and dated 23 April 2018. In 1912, Pierre Bonnard purchased a house in Vernon, a hamlet in Normandy overlooking the Seine valley. From that year and until 1938, when the property was sold, and he relocated for good to Le Cannet, in the South of France (fig. 1), the place became for the artist a source of constant inspiration for a number of important oil paintings but also sketches and watercolours that were crucial part of the artist’s creative process, of which the present one is a primary example. Indissolubly associated with nearby Giverny -where Claude Monet lived from 1883 until his death in 1926 – Vernon provided Bonnard with idyllic, undulated landscape rich with trees and vistas, whilst Ma Roulotte, the artist’s and his model and companion Marthe’s house, was source of inspiration for canvases depicting its interiors and terraces. The artist’s oeuvre from this period, be it painted at Vernonnet and its surrounding areas or in the South of France, reflects his renovated interest in natural configurations and interaction of colour with light, as well as with the human figure that is so often inseparable from them. The present watercolour shares common characteristic with a number of oils and sketches in which the familiar slope from the house to the silvery banks of the river Seine can be glimpsed from between the trees. Indeed, Bonnard’s deep fascination with trees is here exemplified by the two plants which, masterfully centred in the middle-ground, become its true subjects, giving special ascending rhythm to the composition. Trees and luxuriant vegetation are often predominant in Bonnard’s paintings from the 1920s and 1930s, establishing vertiginous, impeding patterns that invest the viewer with full force whilst also bearing testament to his sense of decoration and disregard of perspective. Excellent examples of this are his Balcon à Vernonnet (1920-23; Musée des Beaux-Arts, Brest), and Paysage Normand from 1920 (Musée Unterlinden, Colmar, fig. 4), displaying, as it were, a similar rising arrangement of a pair of mature trees in the middle ground. The viewer’s eyes are thus dragged upwards from left to right along the entirety of the watercolour, with its soft hues that so well capture the light of Seine valley at dusk. Importantly, this ascending movement is a device employed by the artist in some of his most successful landscapes, including Terrasse à Vernon (1923, Private Collection). Yet, it is perhaps with the posterior Échappée sur la rivière (National Galleries of Scotland, see above, fig. 3) that the present work relates best: notice and compare the layering of the background where river hills and sky become stratifications of pale blue and purple. But perhaps one of the most striking and important features of the present drawing is the presence, almost in nuce, of the above-mentioned stratification of patches of colour which, fully developed by Bonnard in the following decade, was to have such a profound influence on Mark Rothko. Rothko’s encounter with Bonnard’s treatment of light and colour strata, brought on by the latter’s memorial show at the Museum of Modern Art in New York in 1948, was instrumental in defining the former’s development of large canvases of floating planes of colour (figs. 5 and 6). For Bonnard as much as for Rothko, colour was “a means of expression”, and it is thus that the somewhat unrealistic hues of the present watercolour take on a double meaning, reflecting a state of the mind as well as the light at a particular time and place. Key elements of his every-day production, Bonnard rarely parted with his drawings and sketches. As a consequence, his production as a draughtsman has been comparatively neglected. Additionally, as noted by Sargy Mann, Bonnard’s drawings are far removed by the notion of “fine draughtsmanship” as perfected in the Renaissance and perpetuated by artists such as his near-contemporary Degas. Because from early on in his career Bonnard chose to paint with in his mind “the idea”, rather than from direct observation, he had to heavily rely on memory, as well as on a multitude of drawings and sketches, which became of critical importance to him, certainly more than to any of his fellow artists. It is with such aides memoires at hand that he was able to recreate that sense of sudden irruption into a room, or of a landscape rushing against the viewer, in the immediacy of the recollection. Bonnard’s works on paper therefore came to function as stills of a particular experience, one that would be later translated onto the canvas. 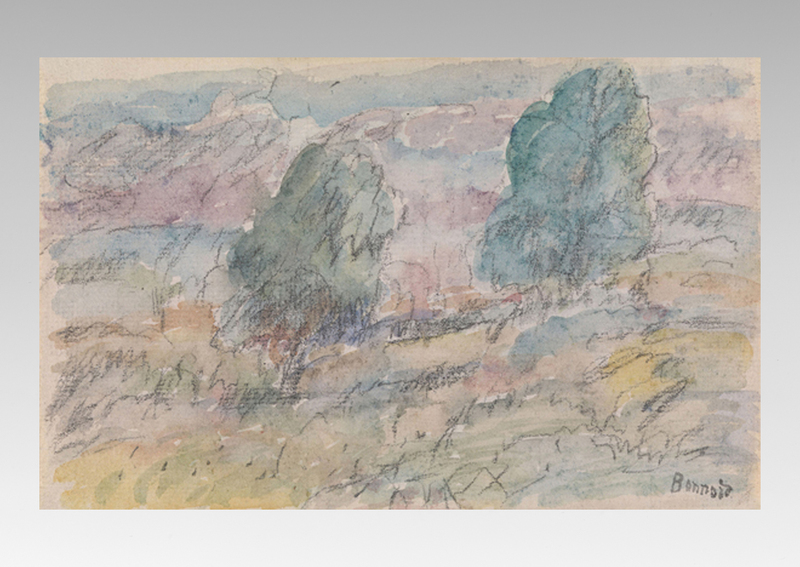 To conclude, not only is the present watercolour an unusually refined example of Bonnard’s idiosyncratic draughtsmanship which was at the core of his artistic output. It is also one of the earliest preludes of his most successful experimentations with colour palette and treatment of light. S. Mann, in Drawing by Bonnard, exh. cat., Hayward Gallery, London, 1984.